Since August, the market has been in a funk, plunging at the end of July and then range-bound, more or less moving sideways for two months. 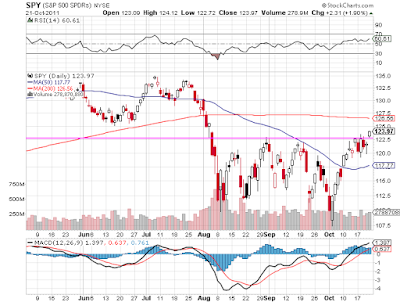 The top of the range is notated in the chart below by the horizontal magenta line in the daily chart of SPY, the S&P 500 ETF. On Friday, however, we finally got a decisive move out of the range and above the magenta line. The question on everyone's minds is: does this breakout have staying power? Activity in Europe is still the wildcard and is pretty much unpredictable so in this post we'll just stick to the the technicals as we see them. For those readers who are new to TradeRadar or who don't remember what this is all about, the data for the following charts is generated from our weekly Alert HQ process. We scan roughly 6200 stocks and ETFs each weekend and gather the statistics presented below. In this first chart below we count the number of stocks above various exponential moving averages and count the number of moving average crossovers, as well. We then plot the results against a weekly chart of the SPDR S&P 500 ETF (SPY). This chart reinforces the fact that a reversal has taken place and that a breakout is underway. Three weeks ago, after making some pretty extreme lows, this chart showed a very modest turning up of the yellow and magenta lines. In contrast, last week's charts showed strongly accelerating bullish momentum. Now, this week's chart shows the improvement in the number of stocks above their 50-EMA slowing noticeably while the number of stocks whose 20-day EMA are above their 50-day EMA is still increasing solidly. This suggests a pause in this recent up-trend is very possible. Note also that the absolute levels of the yellow and magenta lines clearly indicate the market is not yet over-bought and that the newly established up-trend has more room to run. This chart tells the same story as the previous chart. The number of stocks in down-trends (red line) has dropped to an extreme low but the number of stocks in solid up-trends (yellow line) is no where near any kind of over-bought extreme. Here we also see a moderation in the bullish action this week as the yellow line registered only a small increase over the previous week's bigger move. Again, the expectation is for further gains in the market but with a pause very likely. The up-trend being discussed in this post should still be considered a short-term trend. It has really only been three weeks since SPY hit a bottom and established a reversal pattern. Clearing the top of the recent range is a positive sign as is the fact that the 50-day moving average has turned up. The fact that there was at least a modest pick up in volume is also a good sign considering that much of the recent rally has been on lower volume. Nevertheless, a powerful trend needs to manifest itself over more than a few weeks. And investors should note that resistance in the form of the 200-day moving average and the June lows will soon come into play. That being said, it is certainly easier to be optimistic about stocks now but equally hard to shake off an attitude of caution. What else might keep stocks moving in a positive direction? With Europe drowning out most other topics, it is almost easy to forget we are in the middle of earnings season! The good news is that most companies are reporting pretty decent results and, though some forward guidance has been rather less than confident, there are very few companies that are outright bearish in their expectations for the next quarter or two. This suggests the economy will continue to muddle along in slow-growth mode rather than fall off a cliff. So as long as the politicians in Europe or the U.S. don't mess up too badly, the outlook for stocks over the next few months is starting to look better.